When the car has problems, we call a mechanic. If we’re making a big financial decision, we book an accountant. 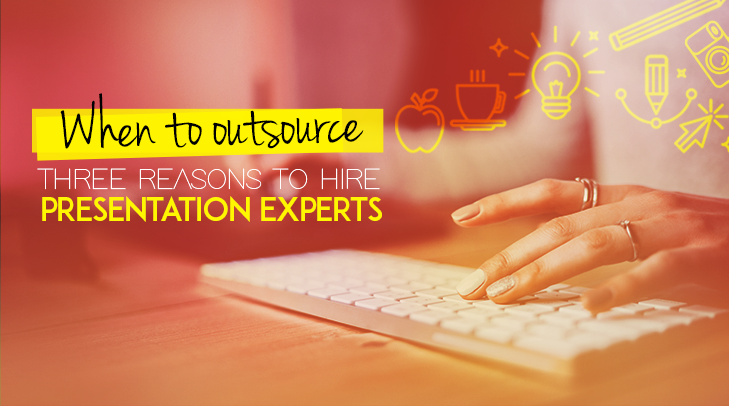 We could try to do these tasks ourselves, but when the stakes are high, it makes sense to hire experts. Why is it then that when it comes to presentations this rule goes out the window? Studies report almost 30 per cent of leaders spend five hours or more a week creating slide decks but 55 per cent report they hate doing it! Even worse, 66 per cent of these self-made presentations got delivered to potential and existing customers. When your brand and company reputation is on the line, the stakes are sky high, so you surely don’t want to fall short. Productivity is linked closely with wise use of time. However, a survey of more than 1,000 workers found employees spent 20 hours per month on average creating presentations. In financial terms that translates to a company executive using $20,000 per year of their time on designing slide decks. Experts can whip up professional-looking slides that hit the mark with audiences in much less time than the average worker ever can. That time spent doing more important tasks is worth the cost of outsourcing this time-consuming chore. What makes the most significant global brands so recognisable? Consistency. Something that most employees don’t achieve when they create their own slides. In fact, presentations miss the mark on brand consistency 75 per cent of the time. Unless you’re a graphic designer, creating a stunning presentation is best left to the experts. Doing so ensures you achieve the desired impact on your audience. Plus, a visually appealing deck always reflects well on your brand. So, if the stakes are high, don’t DIY. By leaving your most important presentation decks in the hands of professional designers, you’ll save time and money, ensure consistency and enjoy high-quality results. Need help for your high-stakes presentation? Let Slidemaster’s team of experts create a compelling presentation that helps you achieve your goals. We’ll deliver a captivating mix of graphics, illustrations, animations and copy that is guaranteed to be nothing short of impressive.